Since my exam was to begin only at 1330, I decided to leave my home a bit late instead of my usual 0633 EMU from Belapur. I took the 0914 EMU from Belapur. The coach was crowded right from the begining, I had to stand at the door itself. I felt happy that I had an FC pass, and I could atleast grab that place to stand!!! 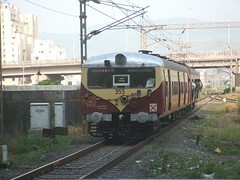 The EMU reached Vashi at about 0930. I went to the ticket counter to purchase a Ticket. The ticket costed Rs. 10. I walked back to Platform 1/2. Now-a-days the Thane local is recieved either on 1 or 2. Earlier it used to be Platform 1 only. At about 0948, the EMU pulled in from Thane. I had expected the new train to come it, but a old rake came in. I was disgusted. The train departed from VSH at about 0955, and reached Thane at around 1025. The run was marvellous and the ride was smooth. The crowd as normal, there were empty seats throughout the journey. I was busy reading for my exam. The exam was over by 1430 (one hour paper! ), and I reached Thane at about 1530. Myself and my friends kept waiting on the FOB for CSTM bound EMUs to come in. One Fast EMU came in, but that was heavily crowded. An Idea struck my mind - There is a Vashi EMU at 1605. I rushed to purchase a Ticket. The counter was computerised, and was working slowly. In finally got the ticket at about 1600. The EMU had already reached Thane by then. My eyes popped out on seeing the EMU! That was the brand new Jessop built rake!!!! The rake was gleaming and smelling fresh of the paint! I got a seat and settled in comfortably! (Details of the Coach will be put up after a detailed analysis in a day or two!). The ride was smooth and very very less jerky. Even the jerk while starting the train was bare minimum. The train reached Vashi at about 1633. I rushed towards the driving cab to admire the beauty. The cab had a single piece windshield, and LED panel for destination. The driver/guard had revolving chairs with arm rest! The driver has happily revolving on his chair and showing off his new vehicle to his colleagues! His door had a wire mesh covering to protect the poor guy from an attack! The train pulled out soon on its next trip to Thane at about 1640. I took a photo (seen at the top). The rake was absolutely beautiful. More on this rake tomorrow! I'll be travelling on the Vashi-Turbhe-Thane route for the next few days! I'll be missing my normal dose of WCAM3s for the next few days :-( I'll severly miss those WDP4s and WDG3As! Hope to get back to that route very soon! Until then - you can read the latest updates from the Thane-Vashi Harbour route!! !